ON-PREMISE PATTER Don't Call It Tiki I story and photos by Geoff Kleinman n its heyday, Trader Vic's represented something special, the introduc- tion of exotic and ethnic flavors in food and drink to the normally staid American palate. Trader Vic's was a place to go out to celebrate and escape the everyday. But as the American dining scene changed, Trader Vic's began to lose some of its luster. In the mid-'90s, the Portland, Oregon Trader Vic's outpost closed its doors after 30 years of service and faded into memory. That is until J. Clayton Hering, a Portland-based real estate broker decided that it was time to bring it back. Occupying a staggering 7,900 square feet in the Pearl District (more than double many of the restaurants it neighbors), the new Portland Trader Vic's is more than an update to the classic bar and restaurant—it's a reboot. Portland location is Joshua Trapman. Trapman's menu pulls from many of the classic Trader Vic's drinks, centered around the eponymous Trader Vic's Mai Tai, but also TRADER VIc'S RETURNS TO PORTLAND Joshua Trapman heads the bar program at Trader Vic's in Portland. Legendary bar man Roberto Valle trained the staff and makes the Trader Vic's Portland outpost something special. The Portland Trader Vic's has taken the core of Trader Vic's original concept and renewed, modernized and updated it. Big bay windows surround the bar and restaurant, giving it a much lighter and more open feeling. Both the bar and food menus have been updated, modernized and locally sourced to help it fit within the vibrant Portland food scene. Heading the bar program at the new 2 / the tasting panel / september 201 1 brings in some modern additions including a locally focused drink, Nelson's Blood, which brings together blood orange purée, dark rum and ginger beer. Trader Vic's uses its own private label of rum for many of its signature cocktails. 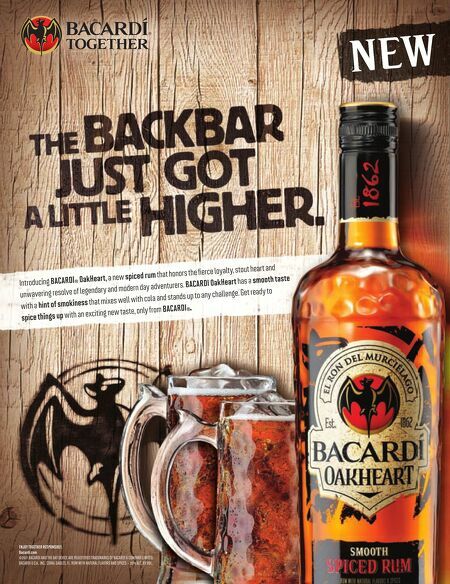 Its Mai Tai rum is a combination of Jamaican and Barbados rum custom-blended for the com- pany. When selecting spirits for the Portland outpost of Trader Vic's, Bar Manager Joshua Trapman started with a list of spirits favored by Peter Seely, grandson of founder Victor "Trader Vic" Bergeron, and then drew from his own knowledge of spirits and the local bar scene to ensure his back bar appealed to the local palate, with spirits like Fernet, Campari and Chartreuse. 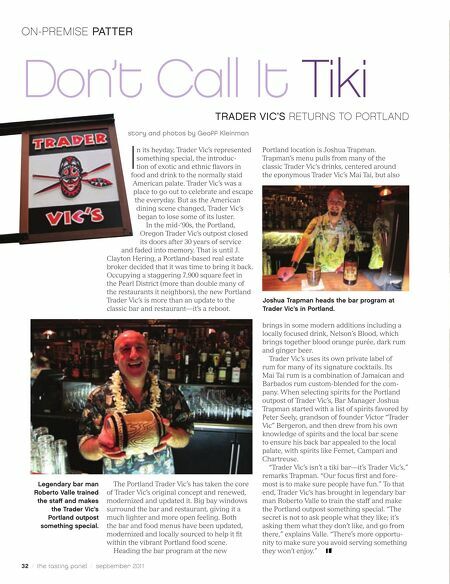 "Trader Vic's isn't a tiki bar—it's Trader Vic's," remarks Trapman. "Our focus first and fore- most is to make sure people have fun." To that end, Trader Vic's has brought in legendary bar man Roberto Valle to train the staff and make the Portland outpost something special. "The secret is not to ask people what they like; it's asking them what they don't like, and go from there," explains Valle. "There's more opportu- nity to make sure you avoid serving something they won't enjoy."